I will sometimes take my cans or bottles home to recycle them if I am somewhere where people just throw them in the trash. We recycle so much stuff…and a lot of that stuff could be used again rather than gone through all the hassle of recycling. I believe that reusing is better than recycling but I am not the best at practicing what I preach…so here goes. When I lived alone I rarely bought milk. I would occasionally pick up a half-gallon carton to make macaroni and cheese or to partake in some other baking or cooking adventure. Since I moved in with someone with kids seven years ago my milk purchases have increased considerably. Several gallons a week, usually. Say I buy 2 gallons a week….that is 104 gallons a year. That is 104 plastic jugs gone to the recycling. Then I imagine all the people on my street. How many plastic gallon jugs of milk do they get? Do they recycle them or put them in the trash? Is recycling all that plastic the best way to go? When I was a kid my mom got milk in a glass jar and returned the bottles. I hope to do the same. The local markets have milk in glass bottles that can be returned. The milk is local and the bottles are reused. The first half gallon I bought was sour so we were off to a bad start…now the kids will always be suspicious of the glass-bottle-cream-top milk. We have gone through one more half gallon and it was not sour. But…the cream top is a bit chunky at first which may disturb some people (even if the chunks taste like cream). Trickery is in order here. I bought a box of Cap’n Crunch on sale at Fred Meyer after I got my hair cut today. Cap’n Crunch will be tasty with milk from the glass bottle even if there is a wee chunk of cream in there. I also suggested we pour off the first bit into another jar to be used for cooking something awesome like mac-n-cheese so the rest of the bottle will not have chunks. I have already done this first pour-off, tonight, so the kids don’t have to shake up the next bottle. For the record, the kids do enjoy the chocolate milk in the glass jar…you don’t even have to shake it. Maybe it is messed up to be worried about using too much plastic but still buying crap like Cap’n Crunch and mac-n-cheese. 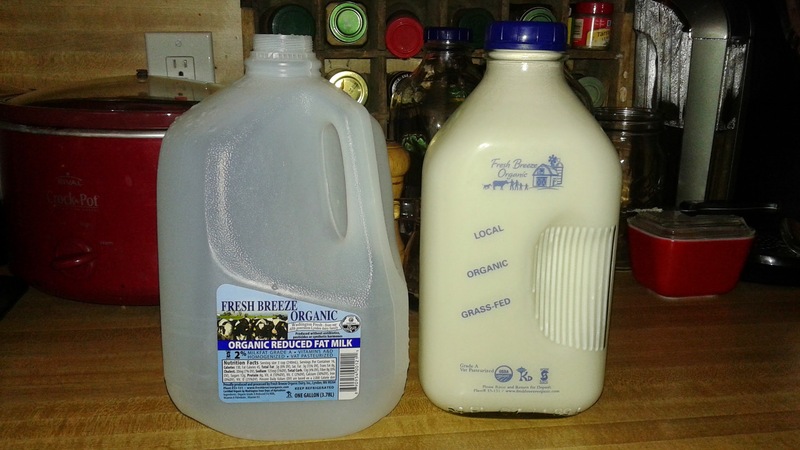 I figure I’m going to buy the milk anyway so if I can get the family to go with the glass bottle I will not be contributing to buying 104 (or more) plastic jugs each year. Now if the beer companies would get in on the deposit bottle thing I wouldn’t have anything to put in the recycling container. This entry was posted in saving the planet and tagged beer, deposit bottle, glass bottle, glass bottles, local, macaroni and cheese, milk, plastic, recycle, reuse. Bookmark the permalink. It wasn’t just milk. It was non-pasteurized whole milk from local farms. I’m surprised you remember. For birthdays I could get the orange sherbet/vanilla ice cream frozen treats there. Remember? With the little wooden spoons? The old storefront is now an espresso/sandwich shop. I remember, and there was cream top. The milk I am getting is pasteurized but it is not homogenized so you have to shake it. The children are disturbed by this. I do remember the ice cream cups with the wooden spoons.